7×30-minute sessions on track. 4 in the morning, and 3 in the afternoon. That’s three and a half hours of uninterrupted track-time!! Working in groups of 5 or 6 bikes per instructor you stay with the same Instructor all day and can work one to one in the afternoon’s free lapping sessions. We believe that to ride safely you need to train at speeds above the Speed Limit. How else can you get that essential safety margin? We don’t do crashes at HRT. In fact, we hold the Cadwell Park record for the most track time achieved in a day because we’re not having to stop for red flags. What group would you like to be in? I agree to the T&C, as well as the Refund Policy. Real bikes with mirrors, headlights and indicators. We don’t do slick tyres or track bikes. This isn’t a cheap race practice day, it’s a quality training day for real riders who want to become safer, smoother and more progressive motorcyclists. Everyone rides to our days, and they usually all ride home too! Practice your cornering skills in the safe environment of a one-way road with no junctions, lamp-posts, bollards. Also known as Cadwell Park Race Circuit. Everyone from novices to experienced riders. Our days are for road-riding motorcyclists. Our fantastic safety record at Cadwell means very, very few stoppages – usually none – and therefore maximum track-time for all. It’s because of this that we get experienced riders from our top A Group returning year after year to enjoy their track riding in safety. It’s also because of our unbeaten safety record that Motorsport Vision allow us to ride in safe, zip-together or one-piece textiles. Your morning will be spent learning the circuit in a mini-group of 6 bikes with your own instructor. Each of your 4 sessions is themed to a particular skill and you will be briefed by your Instructor before each session, and debriefed by him after each session. In the afternoon you will have 3 more 30-minute sessions for free lapping but with your group Instructor standing by to help you at no extra charge – just ask! We allow 60 bikes on what is now called our Better Riding Day Extra. Booking-in starts at between 7.15 and 7.30am with noise testing ( max 105 Db. – you will not be allowed to participate if your bike is louder than this!) Then go to the Paddock Office and register. You will need your driving licence (either part) to register. There will then be a mandatory pre-ride briefing in the Clubhouse at 8.30am. Again – you will not ride if you don’t attend the briefing. The 7 x 30-minute sessions on track start with Group A at 9am on the dot, then Group B at 9.30, and your morning will be spent learning the circuit in a mini-group of 6 bikes with your own instructor, with each of the 4 sessions being themed to a particular skill. Lunch is between 12.30pm and 1.30pm, at which time there is a safety briefing before your 3×30 minute ‘free-lapping’ sessions starting at 2pm. For these sessions you will be led out by your Instructor for a lap after which he may wave you by – or leave you for a few laps on his own. Instructors will be standing by to help you at no extra charge – you just have to ask! Some Instructors will also be riding in each session for their own pleasure and practice as well as watching out for potential dangers. Everyone who is over 18 (with a full licence) or 21 with a provisional licence. 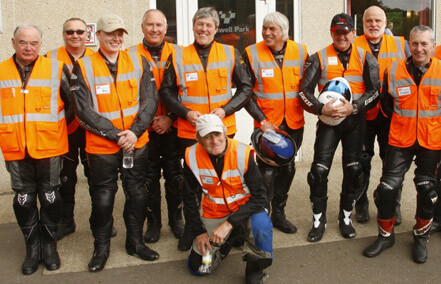 99% of our participants ride to the circuit (and home again) from all corners of the UK, and that includes our Instructors! This day is for road-riding motorcyclists and everyone’s bike must be road legal with mirrors and working indicators. Our fantastic safety record at Cadwell means very, very few stoppages – usually none – and therefore maximum track-time for all. It’s because of this that we get fast, experienced riders from our top A Group returning year after year to enjoy their track training in safety without the horrendous crashes of ‘ordinary’ track days. ! There are 2 main groups A, and B, each main group assembles in 5 mini-groups of 5 or 6 bikes. Each mini-group lines up behind a numbered cone 1-5 and we try to get them in speed order (1 being the fastest/ more experienced). Each mini-group is allocated one of our 10 instructors for the whole day..
Group A (Green) is split between fast regulars and others, so that’s A+ and A. You need to have been assessed and passed to hold the coveted A+sticker. Group B (Amber) is for riders who may not know Cadwell Park circuit very well but describe themselves as ‘progressive’ on the road. In mini-groups 4 and 5 of Group B we have the less experienced and more nervous riders. These lovely people take away most skills improvement from the day. In the end, our main concern is that NO-ONE is frustrated or frightened! And that NO-ONE crashes! We engender friendliness throughout, and we don’t tolerate bullies. We must also limit the mini-groups to 6 bikes in order that everyone gets their turn with their instructor. You’ll need your full driving licence, the paperwork from your joining pack, your group sticker on the front of your bike and a road legal bike. A little cash for lunch and possibly some petrol in the afternoon is also good. Cadwell Park enforce a noise limit of 105DB and your bike will be tested before the day starts. We’ve never had a factory exhaust fail this test, but some after market cans can be loud. If you have a removable baffle in your can make sure you have it in, or at least bring it with you just in case! We ask that headlights be switched off on the day to allow instructors to easily identify each other in their mirrors. If your bike doesn’t allow you to switch your lights off, please use some gaffa tape or similar to cover them or maybe pull the headlight fuse out. Because of our safety record we have special permission from MSV, the owners of Cadwell Park, to allow the use of textiles on our Better Riding Days. So good quality zip together textiles are allowed. We’d also recommend a back protector if your kit doesn’t have one built in. Leathers are also great, either two piece or all in one. Whatever you wear the top must connect to the trouser, either with an all round zip or at the very least a zippable flap. If you do happen to come off and slide along the ground a jacket that rides up and exposes bare skin is no use at all! If you’re towards the top of group A or A+ we really do recommend leathers and a back protector. We are an advanced training company for motorcyclists – formed in 2001. Since 1988 we have taken our motorcycling very seriously indeed. 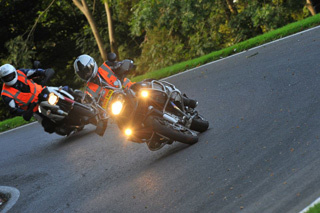 As former Nurburgring Instructors we brought some of the crazy German ideas over to Blighty and adapted them over time into what is now our Better Riding Day. We now have 12 to 15 Qualified Instructors on our team who have embraced our systems and teach the HRT Method with complete confidence. We trust these guys implicitly, and you can too – we have invested a lot of time making sure they are the best! We have 12 to 15 HRT Qualified Instructors who all look very dapper in our HRT instructor bibs! You will find a wealth of knowledge on our team, with IAM Senior Observers, RoSPA Tutors and Instructors, flat track racers, road racers, motocrossers, endurance racers, trials riders, national and international champions and even an HMRC tax inspector… You name it! 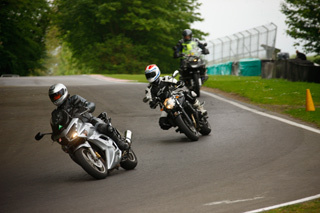 Our Better Riding Days have such a good reputation in the community that the Lincolnshire Police Road Safety Partnership choose to use HRT to run their Performance Plus days at Cadwell Park. You can find out more about those days, which are a great taster of the full Better Riding Day, on the LRSP website. As well as track work HRT runs Advanced Machine Skills days where we look in serious detail at life saving skills like swerving and braking. We have been chosen by Essex Fire Brigade to run these days under their banner providing life saving skills to motorcyclists. For more details have a look at the Fire Bike Advanced Machine Skills website. If there’s anything you’d like to know then drop Martin an email using the form here. This is also a great way to send us any feedback you might have after being on one of our days! If you’d prefer to call, you can get Martin on 07881 878989.